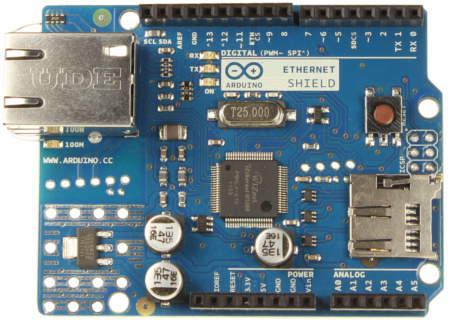 Arduino Ethernet Shield는 Arduino Platform들을 Internet에 연결할 수 있는 Arduino Platform에 Plug-in하는 Module이다. Ethernet Shield에는 TCP/UDP Network stack을 처리할 수 있는 Ethernet Chip인 W5100 (WIZnet)가 onboard되어 있다. 이 칩과 제공되는 Ethernet Library를 통해 Arduino Platform이 Internet에 연결될수 있도록 합니다. 또한 이 Shield에서 RJ45 (Ethernet) Port를 통해 Ethernet Cable를 연결할 수 있으며, Micro-SD Slot을 지원하여 Network를 통한 File을 저장할 수 있도록 지원한다. Arduino의 MCU와 Ethernet Shield의 W5100의 Connection을 위해 Serial Peripheral Interface(SPI)를 사용한다. SPI는 Synchronous Serial data protocol를 사용하며 Duplex를 지원하는 Bus Interface이다. 아래와 깉이 MISO, MOSI, SCK, SS 4개의 Line으로 구성돤다. SS (Slave Select) – the pin on each device that the master can use to enable and disable specific devices. 아래 표와 같이 Arduino Board마다 SPI port가 각각 다르며 ICSP에는 SPI Interface가 공통으로 존재합니다.